Caron is one of those brands to which I had a very little exposure. So when hajusuuri decided to write about her experience with Caron boutique in New York, I started thinking about a question for this post. I entertained for a while an idea to go with the in-story question about the number of real urns vs. those in reflections but I thought that most people would get the same answer. And then I decided to expand the question beyond what could be seen on a picture. Right after I asked: “How many perfumes do you think Caron has currently in production (in all lines)?” I realized that I didn’t know the answer. I decided to take a guess. My answer was 15. There were 22 guesses and the most popular answer was 20 (five people). Three commenters guessed 25, two – 18 and 40 and the rest of responses got one answer each. Several months ago Sigrun (Riktig Parfym) mentioned that she was listening to some courses on Coursera. Before then I hadn’t heard about MOOCs (Massive Open Online Courses). I made a bookmark. Usually those bookmarks live in the browser and die without fulfilling their destiny with the move to the next computer. But this time I didn’t forget about it, checked it out later… and for the last couple of months I’ve been binge watching different courses – mostly unusable for me but interesting. If it weren’t for my work and some other commitments I would have been watching even more: those courses are addictive! One of those impractical courses I took in the beginning was a course on Social Psychology. I liked it very much and went through almost all lectures: at some point it became too political so I skipped some of those. But mostly it was interesting. 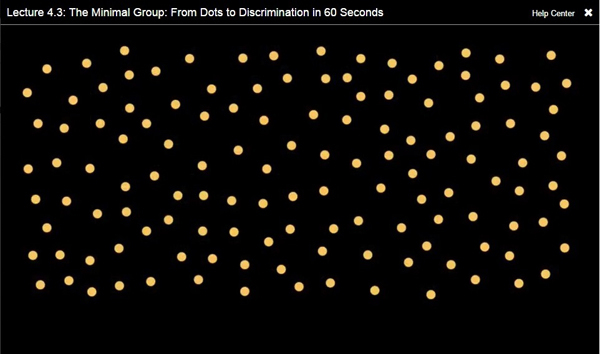 One of the lectures – The Minimal Group: From Dots to Discrimination in 60 Seconds – covered the topic of “ingroups” and “outgroups”, how little it takes for people to identify themselves as a part of some group and start showing in-group favoritism and outgroup derogation. In the middle of the lecture, as a demonstration of the topic, the lecturer asked to take a look at the picture with dots for 5 seconds and, without counting, just estimate the number of dots on the screen. Congratulation! Based on your answer it looks like you are an over-estimator – and we all know it’s better to be an over-estimator than an under-estimator. Right? Well, no. We don’t. To the best of my knowledge there’s no difference in life outcome between people who overestimate or underestimate the number of dots on the screen. But what Tajfel [the researcher] found is that when people were randomly assigned to get a feedback that they were “over-estimators” or “under-estimators”, regardless of the estimates they gave people tended to show ingroup bias – the tendency to favor one’s own group over the members of the outgroup. The experiment was lost on me: not only didn’t I feel good in those couple of seconds between the first statement and its subsequent debunking, but, on the contrary, in that short period of time I felt disappointed: I thought that I was very close to the right answer and, if anything, rather underestimated the number of dots than overestimated them. To be right was more important to me than to belong to a group. My answer was 120. And later, when I got that picture to share with you on this post and counted, I proved to myself that I was right on both counts: I was close and my estimate was slightly lower than the reality: there are 130 dots on that picture. Hajusuuri still hopes to get an official answer to my question from Caron and I’ll share it with you later if it arrives. 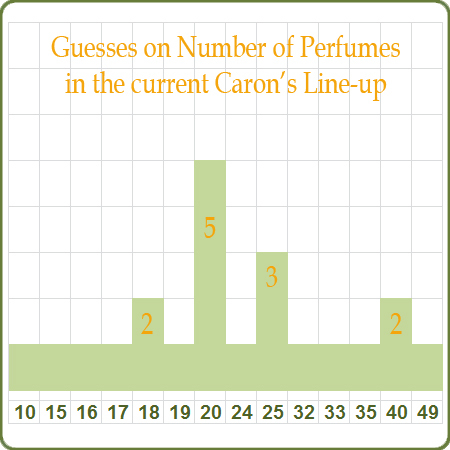 But meanwhile I counted perfumes mentioned on Caron’s website (including those available only from boutiques) – 32. I’m not asking dgambas, I know that even if he’s not feeling good yet, having guessed the right number, he’ll be in a moment when I announce that he also is a randomly (!) chosen winner of the Set 1: samples of Caron perfumes. Set 2: a sample of vintage Caron Bellodgia extrait, a sample of Serge Lutens Boxeuses AND a 4 mL decant of Atelier Cologne Santal Carmin goes to Azar. Winners, please send your mailing address to me or hajusuuri. I was seriously off with my guess, an under-estimator, which isn’t surprising: I’m usually very cautious. But so were most of the respondents. So now I’m curious: under-estimators, do you feel better knowing that there were 17 of us, even though we guessed wrong? Four over-estimators, you were also wrong, but do you feel special because you were more uniquely wrong? Did belonging to a group make you feel better? This entry was posted in My Stats and tagged Caron. Bookmark the permalink. Oh no, too many ‘guesses’ in my comment! You were an even bigger (?) maverick than you realized: do you see that lonely 49 answer all the way on the right of the chart? ;) I must say I was impressed when I saw it. And I immediately started questioning my own 15. I haven’t noticed that! :) In my defense, I was just putting together the pictures of the results that I got from hajusuuri. Interesting and thought provoking (as usual). I didn’t participate in the Caron guessing, but I did take a whirl at the number of dots. I too estimated 120 and was pretty pleased that I was close, and I have to admit, pleased I guessed the same as you. As for the feeling of belonging, I too am usually more satisfied by “being right” rather than fitting in, but I think this may often be to my detriment, and as I age I have eased up on the “rightness”. By the way, missing Rusty’s presence. Thank you, Lindaloo! I promise to rectify Rusty’s absence soon. I really didn’t like being out on a limb when I submitted my guess and felt maybe I should have justified it being so way out of what everyone else thought. I also guessed 120 for the dots! As you can see, you weren’t that far off with your Caron guess – at least much closer than I was. Well, I feel happy. The most important for me was to check my memory, without checking Caron’s site, as I said I explored it many times before. I wanted to give the exact number and my way was “a few less than 40, minus – a few are in more than one collection. 2,3,4, I din’t know. I did not want to say 31-34, so I decided to put 32-33. I just couldn’t say anything based on the beautiful photos because I only thought about the information I already knew. I was happy that the right answer was not a condition for winning because I love random draws in my hobby. BTW, I’m wearing Yatagan in this moment, it is beautiful as usual. I’ll be very happy to try the perfumes I won. Thank you very much. Have a fragrant day, all of you! Once again – congratulations and well done! I also prefer random draws and my questions are usually for entertainment only, I don’t want people to try too hard – it stops being fun. Ha, almost what Ines said… I couldn’t care less if I under or over-estimated ( both under- also the dots) but exactly how unfair is it to come second twice!!! That does not make me feel better in any way. Oh gosh, I did not even notice that you came in 2nd twice. I have to email you about my Copenhagen visit. I already bought my plane ticket so I know I’m going! hehe, I wasn’t really being serious, so no worries :-) But do mail about when you’ll be arriving. Funnily enough, I was more focussed on the patterns emerging from the dot picture than the right number of dots – I wonder what that shows? Probably lack of sleep! The lovely Caron Boutique really is a secret scented jewel box, hidden away as it is. It must be a real treat to visit it. Boo hoo my iPad does not show any of the graphics so I will have to look at them when I get to my laptop. I stopped by the Caron boutique earlier in the week and I got myself one down puff. I got the pink one but really wanted blue. I’ll need to wait until next week when they’re not so crazy busy to see if I can exchange it. Continuing on shopping related news, Bergdorfs now carries 7 limited edition Caron Prestige Collection perfumes! The bottles are so cute — they range from .5 oz of Bellodgia to the largest 1 oz of Fleurs de Rocaille. I have gift cards I had earmarked for something else but one is mighty tempting. It’s very strange about your iPad: WordPress is very well optimized for mobile devices and I never had any problems with either iPad or iPhone. Maybe it was a connection? Oooh more! So I exhibit the classic middle-child syndrome – I can go either way with belonging or not belonging, but like many, I would rather be right than belong. Undina, what is the purpose of guessing (in general) for you? “Пришел и все испортил!” (с) “Изверг! Не мешай нам веселиться!” (c) LOL Sorry! I truly enjoyed your post! My question is an afterthought. Seriously, do you like guessing exercises? To tell you the truth, no, I don’t like guessing. At least not in the situation where knowledge is required. Guessing random things don’t bother me since there I’m not afraid to be wrong. But I love actual puzzles, riddles, etc. We are on the same page. I think, people who enjoy guessing might also like gambling. Just a funny thought. …and your post made me realize I don’t care neither to belong to any group, not to be right… I don’t see any harm in guessing wrong, because it’s just a guess, not knowledge. And to hajusuuri … your photos of the Caron boutique are swoon-worthy! I’ve never been there in person but have ordered my beloved Tabac Blond extrait from there twice. Their service both times was warm and courteous, with the SA (the renowned Diane) always asking what other fragrances I might like to try, resulting in a couple generous extrait samples with each order. J’adore Caron and very much enjoyed your report! Hi Suzanne, thank you for your kind words. The place really IS stunning. Diane is really great to deal with. Vacation sounds good. I mean, it’s a really good reason not to read blogs. On an unrelated note: yesterday I wore Chypre Palatin and was thinking of you. This was a fun post. Thank you for the prize too!! I will e-mail. Regarding the perfume guess: I had no idea if I was anywhere near or far from the right answer. If I had researched the question (I took your advice and did not) I probably would have been disappointed when/if I learned I was wrong. As it is I am quite pleased ;)! I agree: pure guess doesn’t carry the same disappointment as a seriously researched answer. I feel your pain! I’m now at the place with only cellular coverage and I realize how much I rely upon the Internet nowadays. I hope your situation will improve soon.